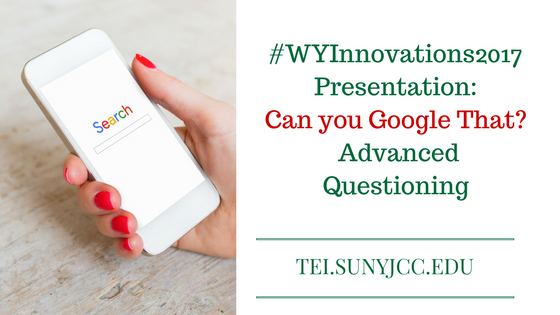 This Wyoming Innovations in Learning session had this description: “Are you asking questions that Google can answer? In a connected classroom, we need to be asking our students questions that Google CANNOT answer. Learn how to change the way you ask questions in a way that promotes curiosity and forces students to use problem-solving and higher order thinking skills.” Travis Allen was the presenter. As you can tell, Allen is not a fan of activities that Google can carry out. He believes that we should stress critical thinking by developing problems that students cannot solve by looking them up on Google. Alan began his presentation by showing a couple of applications that demonstrate how technology can be used in place of rote memorization. Those two applications are Word Lens and Photomath. Word Lens is Google’s translation application that will scan an image and translate the text into the selected language. Photomath is a program that will solve mathematical formulas. You simply scan the formula that you wish to solve and Photomath will work out the problem. Allen showed a Dan Meyer video explaining how to challenge students with real-world problems. If it is a known answer, it can be easily answered with the help of technology. As educators, we need to be less helpful in creating problems and solving them. Use multimedia to help provide context for a question whenever possible. Shorten your questions by removing as many givens as possible. Better yet, let the students build the problem. In other words, be less helpful. The last strategy Allen shared was on the question formation technique. It focused on helping students learn how to formulate the right question. He shared a website with more information on how to prepare better questions. We should not be creating problems that resolve to one answer simply to get the grade. we should be asking why as much as possible. This was a good session. It gave me more to think about.